[What you get]: Lay flat Wireless Charger and USB A to Micro Cable (AC Adapter isn’t included). Support charging with case thinner than 3mm. Metal cases or magnetic objects should be removed. Keeps your device from falling down. The smart chip and premium aluminum shell allows to keep device be cool. The iClever wireless charger is the perfect marriage of quality design, state of the art technology, and convenience. This slim, powerful device can charge all Qi mobile phones in a fraction of the time. No cords needed! Don’t waste your time untangling Micro and Apple Lightning cables. 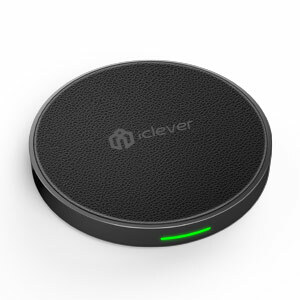 With the iClever wireless charger, you’ll be able to charge your devices without hassle. Simple place your Qi enabled device on the charging surface, sit back, and relax! It really is that easy. With a maximum charging output of 1.67A, you’ll be able to bring your device back from the dead in no time flat. You’ll spend less time charging and more time living your life. At iClever, we go above and beyond to make sure our products are as safe as can be. 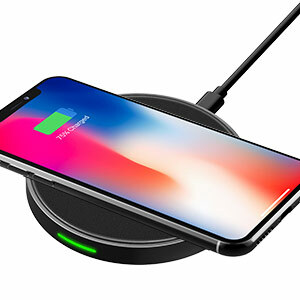 We’ve designed this wireless charger with a smart chip that protect your phone from overheating, excessive voltage, and excessive current. 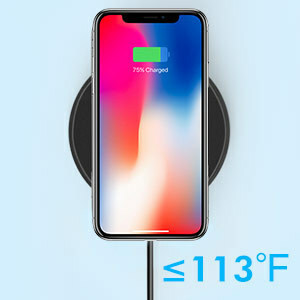 This charger is crafted from high-quality aluminum alloy that dissipates heat, and an intelligent foreign object detector eliminates unnecessary interference.